Logistics is about timing. Leasing is a solution to cope with imbalances in your fleet and can help you to increase overall utilization and minimise demurrage costs. New opportunities or projects often come without notice. Waiting for new equipment could mean that you miss out on the opportunity. Have a look at our project bases lease solutions which are ideal for projects with fixed and variable durations. Leasing reduces your CAPEX requirements and allows you to keep your cash available for investments in your core business. We like to keep it simple. Our lease contracts are straight forward without unnecessary red tape. We offer tailor made and fixed rate long term lease solutions for any duration required. In volatile markets the future is sometimes difficult to predict. Our short term lease model is a suitable solution to these ever changing markets. We aim to offer flexible contract terms which should provide a perfect fit to cover for temporary shortages, fluctuating capacity requirements and open ended projects. Need one or multiple tanks for shutdown, temporary storage or other projects? Do not want to be bothered by trucking, cleaning, repair and other operational necessities? No lifting equipment available, tanks to remain on chassis or to be positioned on a drip tray? Our all-in, one stop project based lease model is the ideal solution. We have been successfully managing fleets of several oil majors and top 10 global chemical companies in different areas of the world. Please feel free to contact any of our team members for further information. Regardless of the period leased there will always be repair costs when the tank is returned to the depot for off-hire. Gaskets need to be replaced, the steam system has to be checked and damages need to be repaired up to an industry standard (ITCO) before the tank can be leased to the next customer. Peacock cooperates with leading universities to optimize ISO tank operations. Studies like our heating project increase understanding of the heating process of an ISO tank, reducing turnaround time and saving costs for our customers. From edible oils, food grade ethanol and fructose to drinking water, beer and chocolate. We have a dedicated fleet of standard tanks, swap bodies and special tanks only used for liquid foodstuff products. It is all about finding the right balance between the highest payload and maximum flexibility. This is a complex formula including road weight limitations, transport modalities used, specific gravities of the products and empty movement reduction. Peacock’s team is geared for these business cases and our fleet is tailored to offer the optimal tank needed. During the design and manufacture we focus on weights, operational efficiencies such as baffle plates, heating capacity, insulation value and safety features like ground operated handrails and airlines. When transporting high volumes of liquids or gases to remote area’s for infrastructure projects, mining, or energy supply, Peacock’s bitumen, special or gas tanks are an ideal solution. Robust and dedicated for the products to be carried, these tanks are low in maintenance, flexible in use and offer optimal payload performance. Have a look at our special, bitumen and gas tanks to find out what we can offer. Have a look at our gas tanks to see the various types and options we offer. Making our world of transportation more sustainable is an obligation we take very serious. Peacock is working hard to find new sustainable innovative solutions which can contribute to this goal. Reducing CO2 emissions can be achieved by better utilization of transport but also in more efficient tank containers. 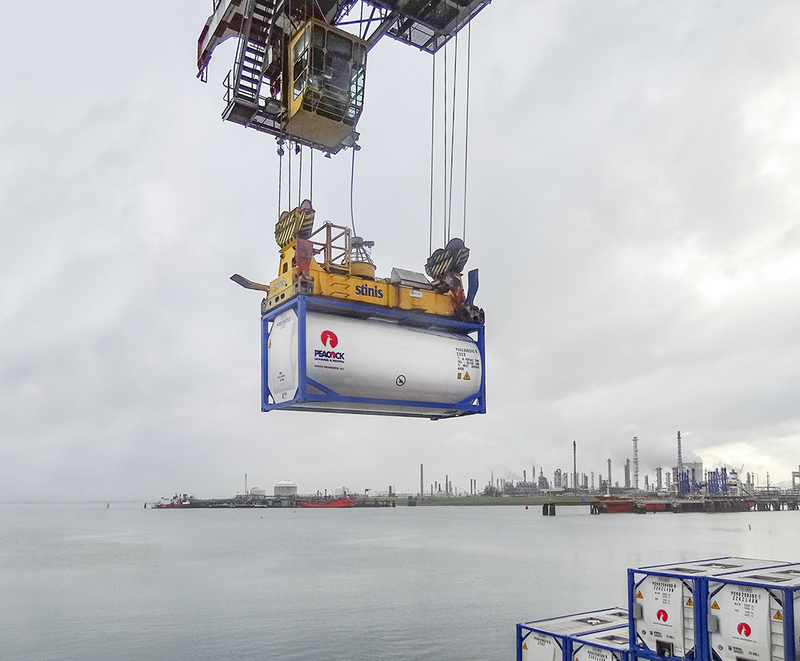 Lighter tank containers contribute to a reduction in CO2 emissions per transport unit. In recent years we have been working hard on the development of special composite materials and lighter constructions for our tank containers while maintaining the same strength. Our latest innovation is the special composite tank container that is 40% lighter than conventional tank containers. Through our offices in Singapore and Rotterdam we serve a broad base of customers which include large petro-chemical producers, oil majors and nearly all global iso tank operators. Peacock’s team includes 10 people and is well experienced, highly educated yet still one of the youngest in the industry. We enjoy being innovative and different to find new and sustainable solutions for our customers. (Please have a look at our heating case study). Through our global contacts with agents, depots and surveyors we have created a network which benefits our customers in their daily business. Besides a clear focus on operational efficiencies for our customers we are very much aware of our corporate social responsibilities within the chemical and food stuff supply chains. We therefore continually try to find new ways to improve sustainability and safe working. Although one of the youngest within the industry, Peacock’s team members have on average more than 10 years’ experience and have expertise in chemical engineering, logistics, commerce and finance. We own all the tanks in our fleet so decisions are quickly made and do not need authorization from third party investors. Peacock is privately owned and has a flat organizational structure, improving decision making. We like to keeps things simple and aim to be hands-on if it comes to communications, operations and service. Peacock reorganized and refinanced. Headquarters and fleet domicile moved to Singapore. Peacock Acquired the business of Rotterdam based Altermij Tankverhuur B.V.